Cardiff City 3 Manchester City 2: Campbell’s Double Header Nails Pellegrini’s Men in Wales as Soldado Scores For Spurs. Fraser Campbell scored a second-half brace for Welsh club Cardiff City to help expose the defensive frailties of the coach Manuel Pellegrini-led Manchester City in their second game of the English Premieir League. Campbell Celebrates After Scoring For Cardiff City. After falling behind to Edin Dzeko’s powerful 52nd minute opener, Aaron Gunnarsson leveled up for Malky Mackay’s side before the Manchester United youth product headed home twice within eight minutes to earn the last season Championship winners their first victory on the return to top flight football. With four minutes of stoppage time left to be played, Alvaro Negredo pulled one back for the 2011/12 champions but Cardiff held on for the remainder of the game. “It was a pity,” Pellegrini said after the match. “I did not expect to lose. We didn’t play well but they played with ten players near their box so was very difficult to score. 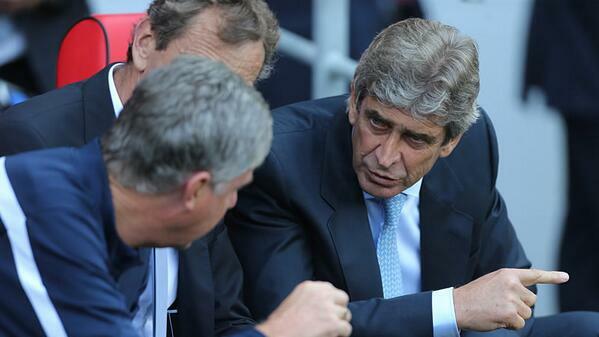 “It’s a Pity We Lost”- Manuel Pellegrini. In the other Sunday match involving Tottenham Hotspur and Swansea, Roberto Soldado scored his fourth goal in three games to steer Spurs to a second victory in front of the White Hart Lane faithful. Jonjo Shelvey fouled Andros Townsend inside the box close to the hour mark before Soldado stepped up to send goalkeeper Michel Vorm the wrong way from the resultant spot kick. 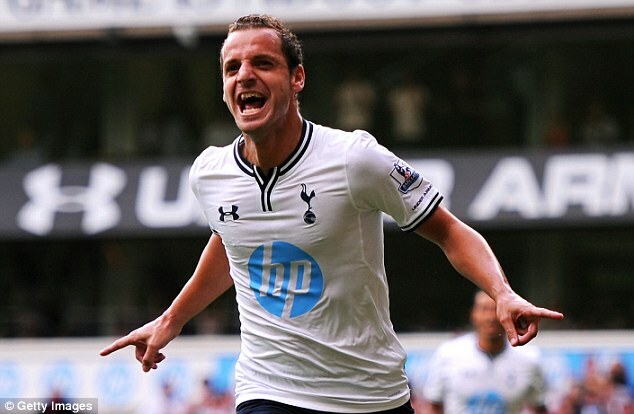 Soldado Celebrates the Winning Goal at White Hart Lane. Both Vincent Kompany and Matija Nastasic missed the trip to Cardiff as Pellegrini gave Javi Garcia a starting role at centre-half alongside Joleon Lescott and Yaya Toure. The hosts got off well , pressing high up the pitch and generally surfing a wave of adrenaline. City’s first purposeful attack came in the 22nd minute when David Silva and Sergio Aguero combined to create confussion in the six yard box before the home defense cleared the line. 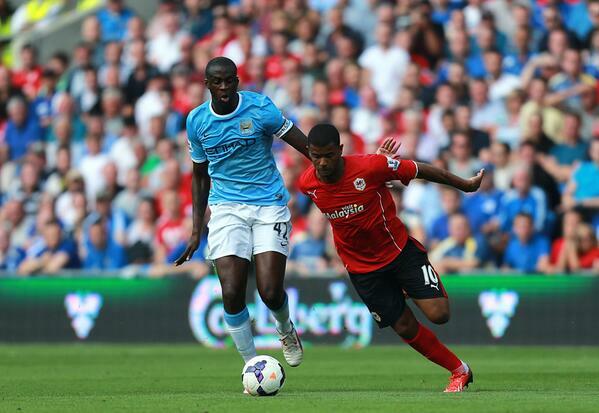 Campbell Was a Thorn in the Man City’s Defence Throughout the Duration of the Game. Towards the end of the first period, Campbell latched on to Garcia’s backwards header but goalkeeper, Joe Hart, raced off his line to make an excellent save. City opened scoring seven minutes after the break as Bosnian forward Dzeko let fly a fierce shot that nicked off a defender and zipped past a diving David Marshal after a pass from Sergio Aguero. 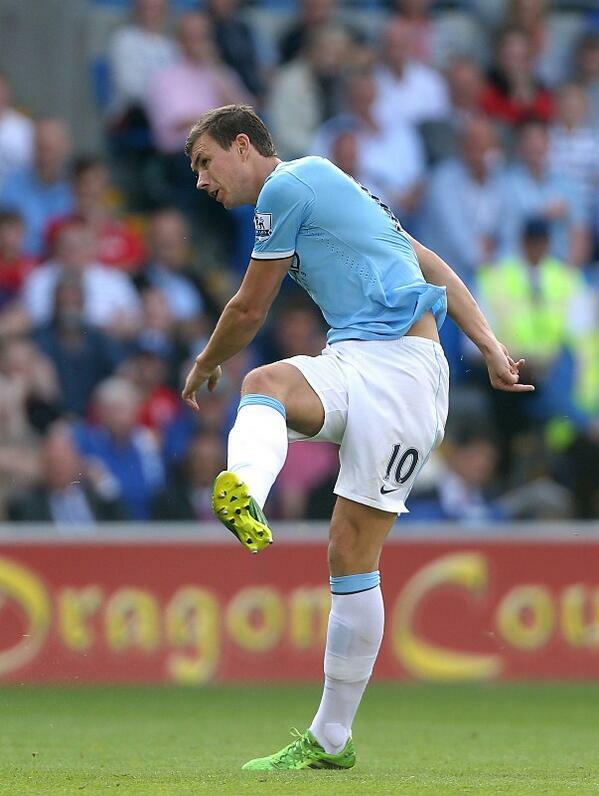 Eden Dzeko, City’s First Goal Scorer. Cardiff equalised within seven minutes as Gunnarsson reacted first to a fine Hart save and struck from six yards. Campbell was later allowed by Pablo Zabaleta, who stood still after Peter Whittingham delivered a corner from the right, a free header to put the Bluebirds ahead. Campbell added his second four minutes from time, heading home following a corner with the visiting defence once more flat-footed. Although, Negredo pulled one back with a quality header during the six minutes regulation time, the visitors couldn’t get an equaliser as Cardiff became the second newly-promoted team after Hull to secure victory in the Premier League season. Nigeria 6-1 Tahiti: Oduamadi Celebrates Three Goals as Eagles Spell T-A-H-I-T-I. NFF Clarifies Win Bonus Argument, Claims Eagles are in Consultations. Previous articleAfrobasket 2013: Nigeria Overcomes Cameroon in a Tightly Contested Duel. Next articleGlo Premier League Week 27: Dolphins Revive Struggling Campaign, Akwa United Sends 3SC to the Drop Zone.